Fraser is almost becoming the next Main St., but it’s not there yet. Although Fraser around 41st and 49th is and has been way more developed, similar activity and density still seems quite a few years away on this particular stretch of Fraser. Jethro’s original location on Dunbar on the west side of Vancouver was infamous for long lineups and big brunch dishes. This Fraser St. location opened up in late 2013 and has been similarly busy, perhaps a bit less so. Jethro’s tagline “Please Eat Responsibly” seems like an ironic joke, as we’ll soon see. Me use that hashtag? Ain’t gonna happen. It was an American food-themed day, with an American diner brunch here, and Southern food dinner from Big Al’s takeover at The Lion’s Den Cafe later on. This Chicken Fried Steak looked promising. Wicca chose The Gold Rush pancakes. Brunch partners ordered The Cobb omelette and Two Eggs & Meat. The Cobb omelette with hash browns and whole wheat toast. You had the choice of either white, whole wheat, or rye. The Cobb omelette also comes with roast turkey, bacon, tomato, avocado and crumbled blue cheese. Aside from the turkey (which tasted like it came from Costco), Jethro’s standard breakfast fare are actually well done. Eggs were fluffy. They could do a bit more with their hashbrowns though. They were more like boring roast potatoes that could’ve used more colour and crispness. I did like the inclusion of onion in the hashbrowns though. Two Eggs & Meat with eggs over-easy and sausages. You had the choice of bacon, sausage or chorizo. Chorizo might’ve been better cuz these sausages were bog-standard. Hashbrowns edging into “why bother?” territory. Eggs well-cooked though, so they do know how to cook a decent egg. 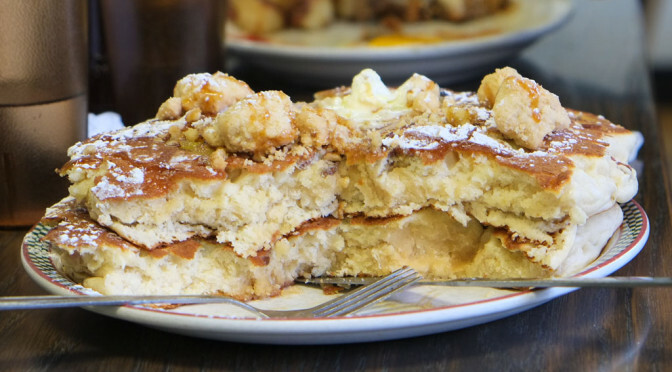 Wicca’s The Gold Rush pancakes, which are banana pancakes with powdered sugar, caramel, pecans and streusel (those pale brown chunks on top). Bigger than your face and impossible for even two people to finish without feeling intense regret afterwards. The embedded pecans tasted raw and untoasted. Raw nuts in my food is always a downer. Nuts always taste better toasted. The pancake itself was dense, heavy, and dry. Large areas of plain pancake. We really needed a lot of syrup to make this enjoyable. There’s no way you could get a light ‘n fluffy pancake if you cook them that big. Pointless. This represents the worst of American food culture — excess for excess’ sake. If they lightened the pancake mix a bit, and if they used the same amount of the goodies without so much of the batter, you’d actually have something worth eating. This bloated monstrosity is totally not worth the calories and is proof that boneheaded machismo needs to disappear from our culinary culture. This is gimmicky, eating contest-type food that is way beneath any person with a shred of good taste. Chicken Fried Steak with sunny side-up eggs. It looked great and the crunchy coating was enticing. Point of comparison: Biscuits and Gravy brunch dish from Portland Craft. A damn tasty sausage gravy. Look at that glossy shine! This is what a brunch gravy should be. The chicken fried steak did taste better with copious shakings of salt and hot sauce. But it should’ve tasted better on its own. The buttered rye bread that came with the Chicken Fried Steak was good though. Shoutout to the toast! Woohoo! We had good intentions because we don’t want to waste food. But…do you really want 2 pounds of crappy pancake sitting in your gut? One for the green bin, unfortunately. Reheating instructions. Nice touch. The service here was pretty good. Friendly enough but to-the-point. However, the main fault here is with the food. If you stick to the standard fare (mainly eggs) you’re good. But more adventurous dishes (at least the ones we tried) were not good. For that kind of rich, over-the-top American diner food, Red Wagon Cafe does a much better job. Their motto is “Please Eat Responsibly”. Perhaps they should cook more responsibly too? Ah a scorched earth review. The gravy texture looks too thick but country gravy is suppose to be white, so they at least nailed the colour. Mental note to avoid the place. I ate there once, perilously close to the kitchen….what I saw was a complete disregard for hygiene even though they knew that back table could see clear into the kitchen. It’s off my list for good. I’ve eaten at Jethro’s three times now (twice on Fraser, once on Dunbar), and they’re out of the game ‘cuz they’ve struck three strikes AFAIC. Over-hyped (and over-priced) meh foods. Blame it on Guy (yeah, *that* “Guy”) ? Who knows ? You just get the sense the good intentions of the owners are no longer there and the place is just on autopilot coasting on the hype they received in their first couple of years. For consistent (and better) quality “Merican diner foods, go to The Red Wagon. You won’t strike out. Fun fact: Bo of Bo Laksa King cooked at the Fraser JFG for a short while. Not so fun fact: I had brunch at the Dunbar one. Once. Never again. They did the dreaded “sub out a major ingredient and don’t tell the customer, hoping she won’t notice” fandango. And the food was meh. Double whammy.